Well, it looks like we're in for yet another major snowstorm at Exfanding HQ, and if this one's as bad as the last one, I'll be sitting out the Wednesday ritual and opting instead to brave the weather some other day (probably Thursday) and let my comics sit at the store for a while. Since I'm writing this on Tuesday afternoon and the weather reports keep changing (mostly, I might add, in order to increase the amount of snow we'll likely be assaulted with here on the East Coast), I'm just wondering if stores in this area will even get their shipments of new books today. And, if they do, will anyone show up to buy them? Last week (actually, just a couple days ago) when we were hammered with nearly 10 more inches of snow, I got stuck on a major highway...that was closed. While I was on it. Due to several accidents about a mile in front of me, the entire highway was closed, and it didn't re-open for just about 2 hours. While I was on it. My just-about-1-hour daily commute home turned into a 4-plus-hour nightmare. Fortunately, I made it home in one piece, and I hope the accidents up ahead of me weren't too serious. And, being that winter only officially started, what, 2 weeks ago, it's probably a good assumption that it'll be a long, snowy next month or three. Still, we'll all get our comics fix eventually this week, so let's dive in to the new books. It's not a huge week, but there are a couple of interesting titles hitting stands today, and one in particular that I'd like to talk about. From Image, issue one of a new series called, Infinite Vacation. I pre-ordered this one after seeing it in Previews, mostly because it looked pretty cool and somewhat because Image books are selling out faster than I can buy them these days. About that--the whole fast Image sell-out thing, I mean--it's starting to get ridiculous, and frankly, a little scary. And I don't mean to say that it's a bad thing that Image titles are selling out so quickly. That's a great thing for the company, and for smaller press books in general. Like the speculator craze that took over the comics industry in the 1990s, today people are buying up multiple copies of Image books and selling them online (and, in some despicable cases, in stores) for well above cover price. Why? Because Image books are by nature I know that several retailers have put limits on the number of these books that a single customer can buy, just to ensure that more people (you know, like the ones who'd like to read the books) have a chance to purchase them. Now, when I see an Image book that looks even slightly interesting, I order issue one in Previews, knowing that there's a pretty good chance that I'd miss it completely otherwise. 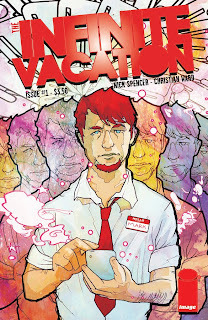 With Infinite Vacation, though, the premise sounds great, and the creators have a proven track record. 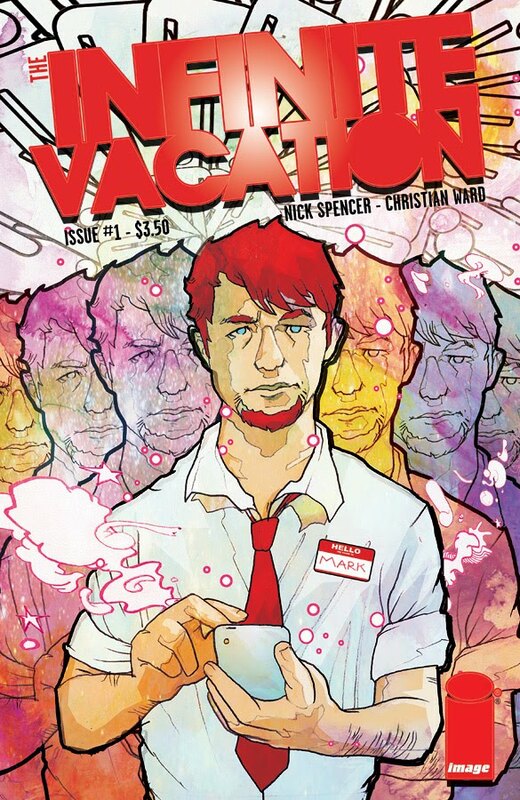 Writer Nick Spencer (Morning Glories--the first of the new, hot Image books of 2010) is a rising star in the industry, and his books are well-crafted and his knack for dialogue and character development is a major selling point for me. Mark lives in a world where alternate realities are up for sale, and buying and trading your way through unlimited variations of yourself is as commonplace as checking your email or updating your status. But when other "hims" start dying suddenly and he meets a mysterious girl who wants nothing to do with "life-changing," he'll learn the truth about the universe he stumbles through, and what happens when your vacation turns on you. See? Told ya it sounded cool. So, if you can get to a store before they're all sold out, take a look and see if it's your kind of thing. With that, I need to be on my way. There's work to be done, and snowstorms to prepare for. But first...what are you Waiting for?